This earthquake was reported from Halifax, Nova Scotia, south to the Chesapeake Bay in Maryland, and from Lake George, New York, east to a ship 300 kilometres east of Cape Ann. The location of the ship is thought to be near the epicenter, because the shock was felt so strongly that those on board believed the ship had run aground. Several aftershocks occurred. This earthquake caused the heaviest damage in the region around Cape Ann and Boston. Stone fences were thrown down throughout the countryside, particularly on a line extending from Boston to Montreal. New springs formed, and old springs dried up. At Scituate (on the coast southeast of Boston), Pembroke (about 15 kilometres southwest of Scituate), and Lancaster (about 40 kilometres west of Boston), cracks opened in the earth. Water and fine sand issued from some of the ground cracks at Pembroke. On November 18, 1755, one of the most significant earthquakes in the northeastern region occurred off Cape Ann. At Boston walls and chimneys were thrown down and stone fences were knocked down (intensity VIII, Modified Mercalli scale). Some descriptions mentioned violent movement of the ground, like waves of the sea, making it necessary to cling to something to prevent being thrown to the ground. At Pembroke and Scituate small chasms opened in the earth through which fine sand reached the surface. Large numbers of fish were killed and many people on vessels felt shocks as if the ships were striking bottom. This earthquake was felt from Lake George, New York, to a point at sea 200 miles east of Cape Ann, and from Chesapeake Bay to the Annapolis River, Nova Scotia, about 300,000 square miles. Reports of a seismic sea wave reaching the West Indies following the earthquake appear to be erroneous. A tsunami had occurred in the West Indies on November 1, 1755, following the great Lisbon earthquake, which apparently led to a report of its association with the Cape Ann earthquake. 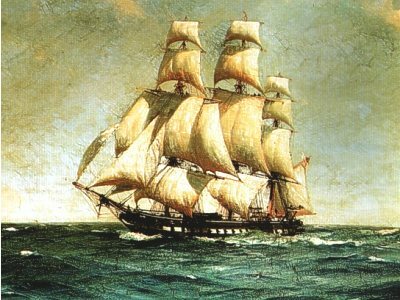 Colonel John Winslow documented a list of ships, bound sites and Acadian numbers on board on October 23, 1755. 1598 and have 500 left for want of Transports Capt Murray has Shipt from Pizquid his whole and are Upwards of 1000. Transcribed from the original manuscript journal, in the library of the Historical Society of Massachusetts, by permission of the Society, in March 1880, under the direction of the record commission. Online transcription available at Nova Scotia Historical Society III - Journal of Colonel John Winslow . Dolphin - Pisiguit / Annapolis, MD - 27 oct 1755 - 30 nov 1755, 230 Acadiens. Elizabeth - Grand-Pré / Annapolis, MD - 27 oct 1755 - 20 nov 1755, 242 Acadiens. Leopard (Leynord) - Grand-Pré / Annapolis, MD - 27 oct 1755 - 24 nov 1755, 178 Acadiens. Ranger - Pisiguit / Annapolis, MD - 27 oct 1755 - 30 nov 1755, 263 Acadiens. 1763: Petition of inhabitants of Acadia neutral inmates in Maryland. A list accompanying the letter dated 7 July 1763 addressed to the Duke of Nivernois. It indicates the name of the head of the family name of his wife and the names of children. This population is dispersed: Newton, 44 people, Georgetown, 68 persons; Snowhill, 68 persons; Princestown, 33 persons; Portabaco, 157 people, Marlborough, 58 persons; Oxford, 169 persons, Baltimore, 77 people. Gold: Archives of the Ministry of Foreign Affairs, England, vol. 450. Tr: PCA. - J.-E. Roy, Rapport sur les Archives de France, pp. 620-627. Providence - Halifax / Caroline du Nord - 30 déc 1755 - ? 1756, 50 Acadiens. Dolphin -Chignectou / South Carolina - 13 oct 1755 - 19 nov 1755, 121 Acadiens. Edward Cornwallis - Chignectou / South Carolina - 13 oct 1755 - 19 nov 1755, 417 Acadiens. Endeavor - Chignectou / South Carolina - 13 oct 1755 - 19 nov 1755, 121 Acadiens. Syren - Chignectou/Annapolis Royal / South Carolina / Georgia - 13 oct 1755 - 27 nov 1755, 21 & 120 Acadiens. Two Brothers - Chignectou / South Carolina - 13 oct 1755 - 11 nov 1755, 132 Acadiens. Hopson - Halifax/Annapolis Royal / South Carolina - 8 déc 1755 - 15 jan1756, 342 Acadiens. Inconnu - Chignectou / South Carolina - ? - ?, 9 Acadiens. Endeavor (Encherée) - Riv-aux-Canards / Williamsburg, VA - 27 oct 1755 - 30 nov 1755, 166 Acadiens. Industry - Riv-aux-Canards / Williamsburg, VA - 27 oct 1755 - 13 nov 1755, 177 Acadiens. Mary - Riv-aux-Canards / Williamsburg, VA - 27 oct 1755 - 13 nov 1755, 182 Acadiens. Neptune - Pisiguit / Williamsburg, VA - 27 oct 1755 - 30 nov 1755, 206 Acadiens. Prosperous - Riv-aux-Canards / Williamsburg, VA - 27 oct 1755 - 13 nov 1755, 152 Acadiens. Sarah and Molly - Grand-Pré / Williamsburg, VA - 27 oct 1755 - 13 nov 1755, 154 Acadiens. Ranger - Les Mines / Williamsburg, VA - 20 dec 1755 - 20 jan1756, 112 Acadiens. Bobby Goodrich - Virginia / Portsmouth - may 1756 - , Acadiens. Fanny Bovey - Virginia / Falmouth - - 17 jun 1756, 250 Acadiens. Goodrige. - Virginia / Angleterre - - , ? Acadiens. Inconnu - Virginia / Liverpool - - , 336 Acadiens. Inconnu - Virginia / Southampton - - , 340 Acadiens. Race Horse - Virginia / Angleterre - - , ? Acadiens. Virginia Packet - Virginia / Bristol - - 26 jun 1756, 299 Acadiens. Jolly Phillip - Chignectou / Georgia - 13 oct 1755 - 30 dec 1755, 129 Acadiens. Prince Frederick - Chignectou / Georgie - 13 oct 1755 - 30 dec 1755, 280 Acadiens. Two Sisters - Annapolis Royal / Connecticut or Rhode Island - 13 oct 1755 - Sinking possible about 250 Acadiens. Inconnu - Les Mines / Connecticut - 30 nov 1755 - 22 jan1756, 173 Acadiens. Edward - Annapolis Royal / Connecticut - 8 dec 1755 - 22 mai 1756, 278 Acadiens. Elizabeth - Annapolis Royal / Connecticut - 8 dec 1755 - 21 jan1756, 280 Acadiens. Dove - Les Mines / Connecticut - 18 dec 1755 - 30 jan 1756, 114 Acadiens. Helena - Annapolis Royal / Boston. MA - 27 oct 1755 - 19 nov 1755, 323 Acadiens. Seaflower - Grand-Pré / Boston. MA - 27 oct 1755 - 15 nov 1755, 206 Acadiens. Swallow - Les Mines / Boston. MA - 13 dec 1755 - 30 jan 1756, 236 Acadiens. Racehorse - Les Mines / Boston, MA - 20 dec 1755 - 26 dec 1755, 120 Acadiens. Vulture - Cap-Sable / Boston, MA - ? - 10 may 1756, 70 Acadiens. Eagle - Halifax / Boston. MA - 1 avr 1756 - 29 may 1756, 4 or more Acadians. 1756: Parkman's Diary and the Acadian Exiles in Massachusetts. Newspaper refering of the Acadians in exile, written by Rev. Ebenezer Parkman, pastor of the Congregational Church at West Borough, Mass.. Quotes and comments by Father Clarence J. d'Entremont and Hector J. Hebert, SJ, article in French Canadian and Acadian Genealogical Review, vol. I, No. 4 1968. Gold: American Antiquarian Society, Worcester (Massachusetts), and partly, Massachusetts Historical Society (Boston). 1756: Query "To His Excellency the Governor General of the Province of Massachusetts Bay from the New England and honorable Gentilhomes Council. Requesting that their children who were forcibly removed from their being made. Signatories: John Landry, Chelmsford, Claude Benoit, Oxford, Claude LeBlanc, Charles LeBlanc and Pierre Daigle, Concord; Augustin LeBlanc, Worcester, Jacques Hebert and Joseph Vincent, Andover; Antoine Hebert, Waltham. This undated complaint was read to the House of Representatives on 13 April 1756. Gold: Massachusetts Archives, Boston, vol. XXIII, French Neutrals, f. 49 (below MA XXIII, 49). Mf: ECA. PCA. - CAP, 1905, App. E, p. 146, Vol. II. 1756: Request to the Lieutenant Governor and the Council in the month of May. Petition of several inhabitants above to Cape Sable (Nova Scotia). They fear being transported to North Carolina where it will be not allowed to engage in work to which they are used, they are fishermen. Request permission to remain in this province where they can be employed in the work they did previously. Marks and Amirau Jacques Joseph d'Entremont. Read to the Council on 5 May 1756. Gold: MA XXIII, 68. Mf: ECA. PCA. Experiment - Annapolis Royal / New York - 8 dec 1755 - 30 may 1756, 250 Acadiens. 1756: Acadiens of the region of Port-Royal arrived in New York on 30 April 1756; May 6 they are distributed in the counties of Westchester, Richmond, Suffolk, King's and Queen's. Their boat, the experiments had taken first to the island St. Kitts, the Caribbean. There were 200 when they left Port-Royal, 50 died of fever in the West, and they were 151 when they arrived in New York. Mentioned the names of family heads with children. Calendar of Council Minutes of New York 1668-1783, vol. 25, page 427, published by Albany, University of State of New York, 1902. - Emile Lauvrière, Tragedy of a People, Vol. II, page 124. - Copy to ECA Documents Placide Gaudet, Box 40, eh. 4. Boscowan - Chignectou / Philadelphie - 13 oct 1755 - Naufrage, 190 Acadiens. Union - Chignectou / Philadelphie - 13 oct 1755 - Naufrage, 392 Acadiens. Hannah - Grand-Pré / Philadelphie - 27 oct 1755 - 19 nov 1755, 140 Acadiens. Swan - Grand-Pré / Philadelphie - 27 oct 1755 - 19 nov 1755, 168 Acadiens. Three Friends - Pisiguit / Philadelphie - 27 oct 1755 - 21 nov 1755, 156 Acadiens. Nearly 300 Acadians were deported in Pennsylvania. The archives of the State retain numerous documents concerning these exiles. Here are grouped the main parts that contain multiple names Acadians. 1756: Report of the Overseers of the Poor on the condition of the exiled Acadians in Philadelphia. This document was written in early 1756. Y indicated the Acadians are the most needy, the number of their children, their health and their condition of life. Copy to ECA Documents Placide Gaudet, Box 40, ch. 18. Reference: Collection of the Historical Society of Pennsylvania. 1756: Petition of the Acadians (dated August). History of Philadelphia by Sharp & Wescott, 1884, vol. 1, p. 249. 1756: Petition of the Acadians (dated September 2). Pennsylvania Prov. Council, page 240. 1757: Order is given to stop Charles LeBlanc, Jean-Baptiste lagern, Philippe Melanson, Paul Bujold and John Landry, accused of by their actions and words of fomenting unrest against his Majesty the King and his subjects, to keep prisoners in Philadelphia as they had not been legally acquitted. Document dated 21 March. Gold: Colonial Records, vols 6, 7 and 8. - American Catholic Historical Society of Philadelphia, vol. V, page 314. 1763: "List of names and numbers accadiens All who are in the Pennsylvania. This list accompanies the letter of 20 June 1763 to the Duke of Choiseul by Paul Doiron, Bruno Pierre Trahan and Landry. It gives the name of the head of the family name of his wife, with few exceptions, and the number of children. Gold: Archives of the Ministry of Foreign Affairs, England, vol. 450. - J: Edmond Roy, Rapport sur les Archives de France, p. 618. Gold: Archives of the Ministry of Foreign Affairs, England, vol. 450, documents relating to the Acadians. - J. Edmond Roy, Rapport sur les Archives de France, p. 617. 1765: Request Etienne Landry and other Acadians scattered throughout Pennsylvania and Maryland. Gold: PRO, C 0 5, America and West lndies (1689-1801, 1829). vol. 83 (616, 624).
" We might," says Rameau, reconstruct the history of a considerable number of families brought from Prince Edward Island to Louisburg, transported from Louisburg to England in 1758, from England to France in 1763, and from France to Guiana in 1764 ; then, brought back to France in 1765 after the disaster of Kourou, they were quartered in the island of Aix, whence they were taken to Rochefort." "Accordingly when, after a few years, the Spanish Government made them advantageous proposals for a settlement in Louisiana, most of these families, together with a great number of others, dwelling elsewhere in France, eagerly accepted them. From 1784 to 1787 a strong current of Acadian emigration set in from France to Louisiana. Of 4,500 Acadians in France in 1763, there remained scarcely eight hundred ; those who were at San Domingo and other West India islands had taken the same direc tion long before. Thus it was not till thirty years after the first deportation, and after suffering all the heart burnings of separation, exile, death, misery in its mul titudinous forms, in fact, all imaginable ills, that this stricken remnant could at length find a lasting asylum." HISTORICAL MEMOIRS FROM THE FIRST SETTLEMENT OF THE COLONY TO THOUGH DEPARTURE OF GOVERNOR O'REILLY IN 1770, FORMING THE FIFTH OF THE SERIES OF HISTORIC AT, COLLECTIONS OF LOUISIANA, B. F. FRENCH, NEW-YORK; LAMPORT, BLAKEMAN & LAW, No. 8 PARK-PLACE, 1853. The Deportation of the Acadians. 1986, Publication of the Minister of Supply and Services, Canada. 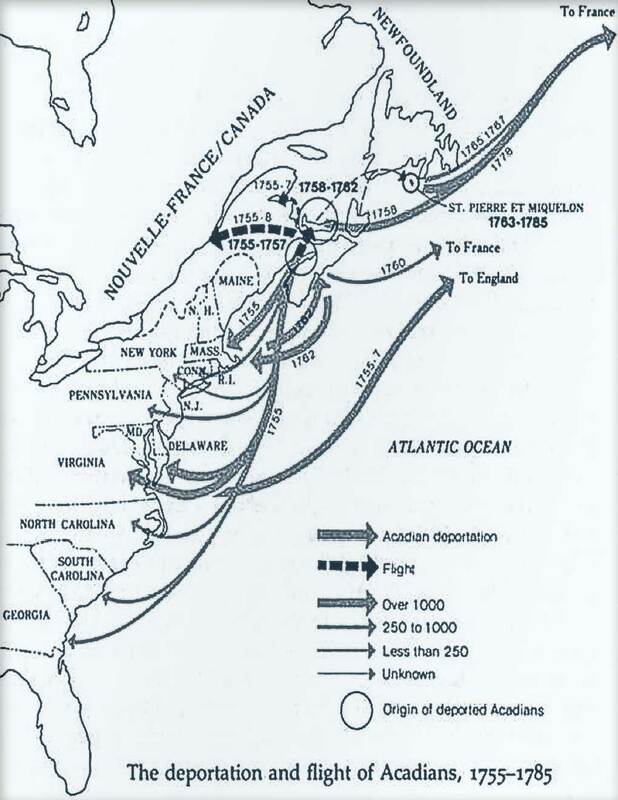 Scattered to the Wind - Dispersal and Wanderings of the Acadians, 1755-1809 by Carl A. Brasseaux. ACCOUNT OF THE DEPORTATION OF THE ACADIANS FROM "HALIBURTON'S HISTORICAL AND STATISTICAL ACCOUNT OF NOVA SCOTIA." Acadia; or a Month with the Blue Noses, by Frederic S. Cozzens; Derby & Jackson, New York, 1859; pp. 302-314. Welcome! This is the Acaidan/Cajun history site of Louisiane Acadien.. This site is part of the Louisiane Acadien, aka Acadian Melancon site. I hope you enjoy the beautiful images that I have accumulated during my Acadian, Cajun, Creole, Cultural and unique Historic Louisiana research and investigation. Please visit our Facebook page at Louisiane Acadien - FaceBook.